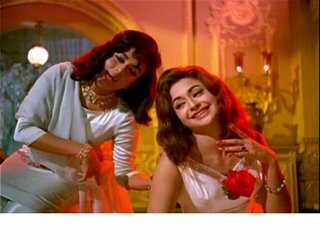 In pursuit of the necklace, the couple go to a bar where Mumbai’s renowned jazzman Chick Chocolate of the fifties is playing a trumpet while Helen is singing: Jhoom re jhoom albele/ Sab se ham hain akele. She is wearing a flamenco outfit. So we have on the dance floor a Franco-Burmese woman (who was known as an Anglo-Indian for the better part of her career) playing a Spanish senorita; a famous Catholic musician from Goa who was popularly known as India’s Louis Armstrong (because of his jazz background and dark skin) playing an anonymous bandwala; and a Punjabi wrestler playing Greystoke, Lord of the Jungle. It might have added extra spice if the Muslim Mumtaz (playing the Hindu girl Rekha Suri) and the almost-Olympian cyclist Jankidas, a Hindu (playing a presumptive Goan Catholic and fixer, Mr Pinto) were also present, but one cannot have everything. The scene is instructive: in this exaggerated tableau of the Other, almost everyone plays a role to which she or he is not suited. Except Helen. She plays herself, which means that she plays a foreign woman who sings in Hindi while remaining an outsider. If you’re in Delhi, drop by the Stein Auditorium at the Habitat Centre today (Wednesday, April 19), where Jerry will discuss his book at 7 pm. He won’t be sharing the stage with Helen, unfortunately, and he does not do cabarets himself–but there will be a screening of Teesri Manzil after the discussion. Jeenewaale jhoomke mastaana ho ke jee, Aanewaali subah she begaana ho ke pee.